If you have been following blog, my recent articles have contained images that I made while in Florida in December. Since returning to Virginia, I have been photographing some of our local birds. This article contains some of my favorite recent images of those birds. 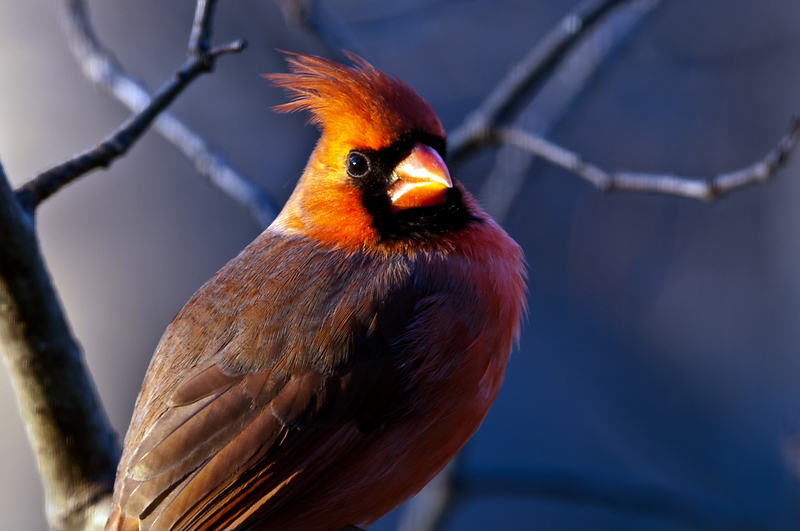 The above image is obviously a male Cardinal. It was taken in the late afternoon as the sun was setting. I love the way the sun is illuminating the Cardinal’s head and how the Cardinal is contrasted against the dark blue background through the tree to the lake. The image was made with my Nikon D300 and 600mm lens at ISO 200, aperture at f/8.0, and shutter speed of 1/40 sec. 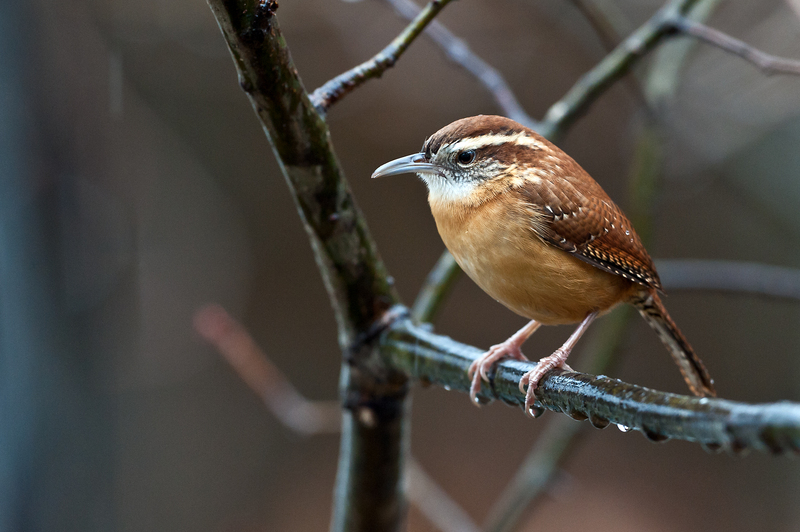 The below image is of one my favorite birds, a Carolina Wren. They are hyperactive birds that rarely sit still moving quickly through the trees and on the ground while flicking their short tails up and down. It had just stopped raining and was overcast. Therefore, the light was very subdued. I used my Nikon D700 because of its high ISO/low noise capability with my 600mm lens, and shot it at ISO 1600, f/5.6, 1/250 sec. The high ISO setting enabled a faster shutter speed to capture the quick moving wren. 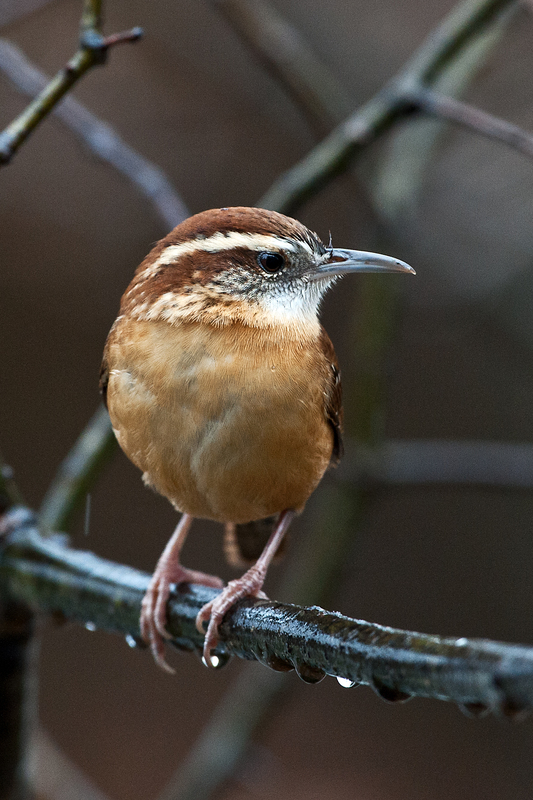 Below is another image of the Carolina Wren also shot as described above. I recommend double clicking on the images to see the image details. Above is another one of my favorite birds, a White Breasted Nuthatch. Nuthatches are also small, fast moving birds. They forage for insects on trunks and branches of trees and are interesting to watch because they hang upside down on branches and climb down the side of trees head-first. 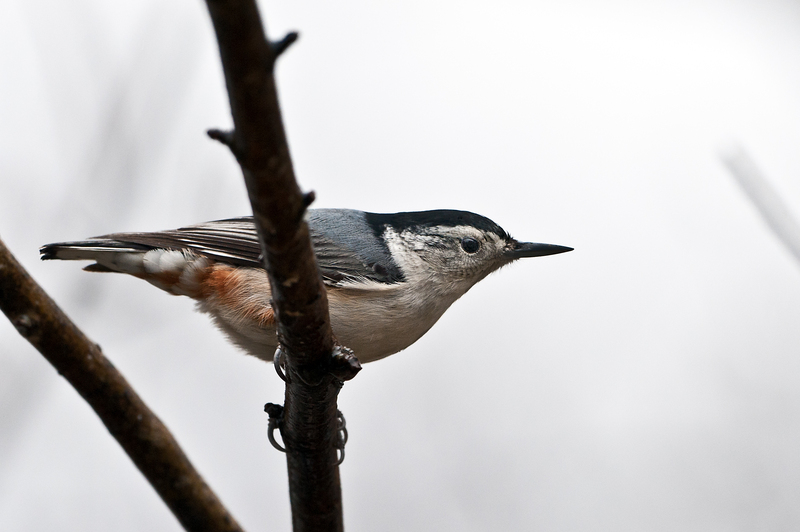 Because it was overcast and nuthatches are fast moving, I also shot this image with my Nikon D700 with the 600mm lens at ISO 1600, f/5.6, 1/640 sec. 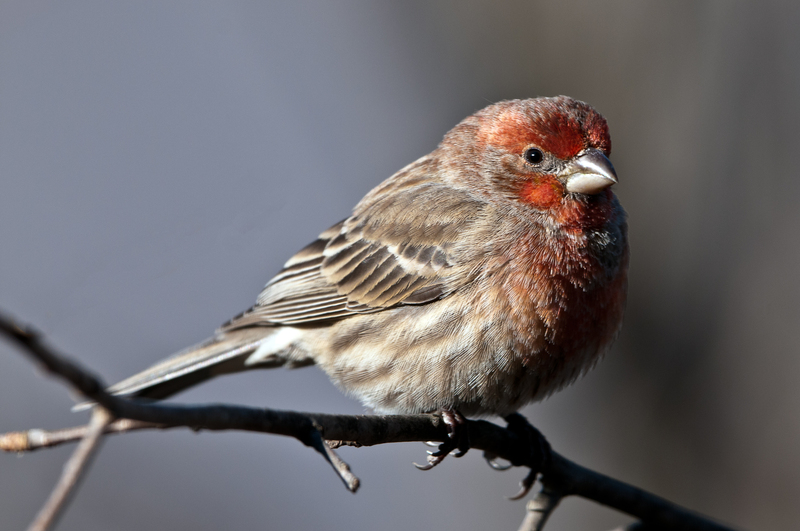 Above is a male House Finch. They too are small birds, but not as quick moving as the wren and nuthatch. They will perch on a branch for longer periods of time, as this one was doing while slightly puffed out. Only the male has bright red feathers. This image was made late in the afternoon with the sun shining on the finch lighting up his red feathers. Since it was a bright day, I used my Nikon D300 and 600mm lens and shot it at ISO 200, f/6.3, 1/400 sec. Above is a female Downy Woodpecker. Females are distinguishable from males, because males have a small red patch of feathers on the back top of their heads. 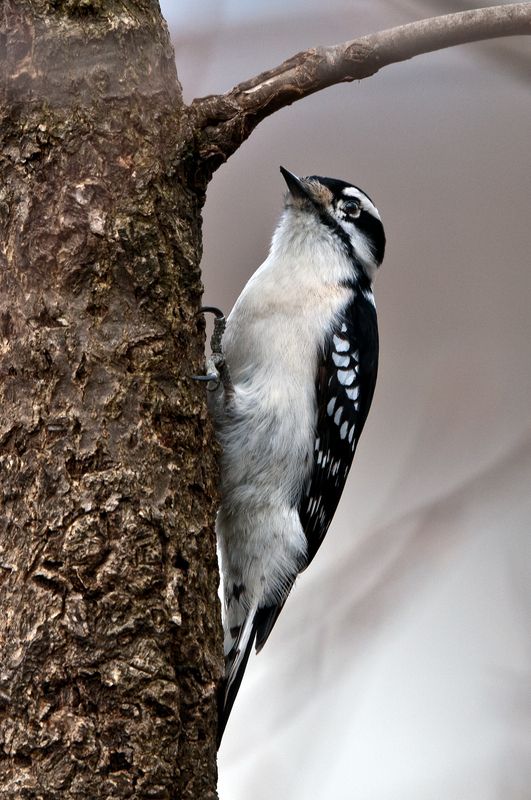 Downy Woodpeckers make lots of noise, both with their shrill whinny call and by drumming on trees. I photographed the Downy Woodpecker with my Nikon D300 and 600mm lens at f/7.1, 1/200, ISO 200. 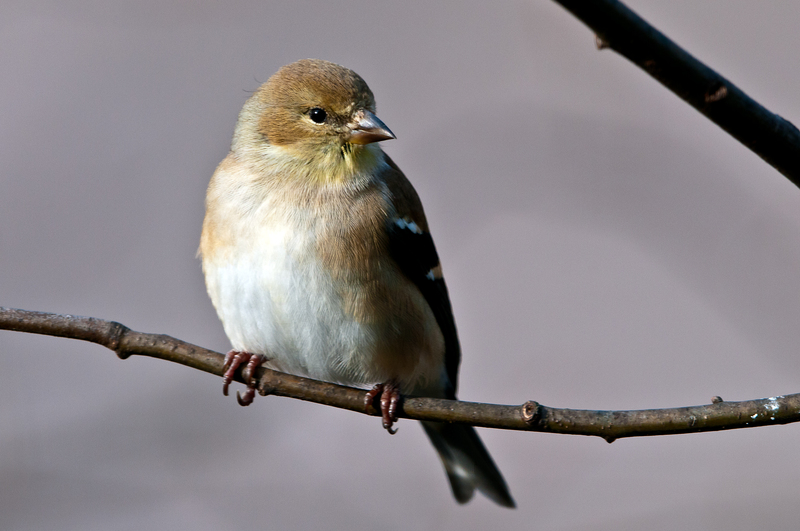 Below is a male American Goldfinch in its winter plumage. During the summer after molting, the male’s feathers are a vibrant yellow. American Goldfinches are social birds and are seen in flocks of various numbers. I captured this image with my Nikon D300 and 600mm lens at f/8.0, 1/250 sec, ISO 200. Above is a male Bluebird starring straight at me as I photograph him. He does not look like he is happy about being photographed. Females are not as brightly colored. 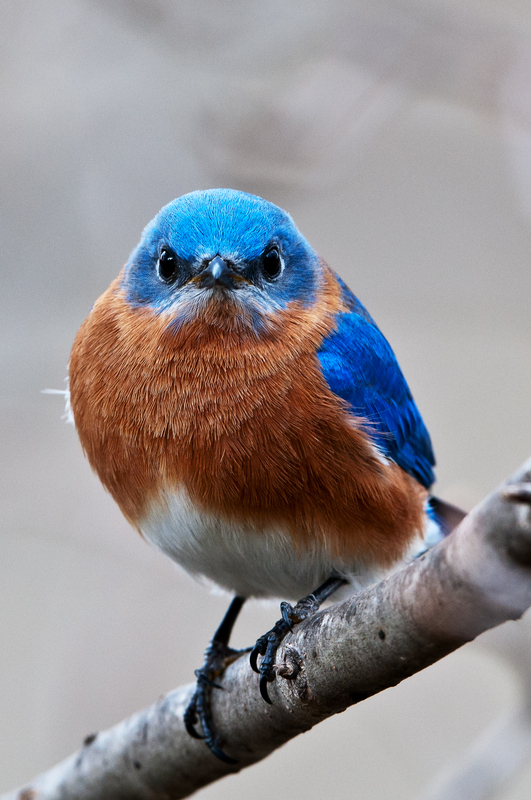 Bluebirds are medium size birds that predominately eat insects. They are territorial, prefer open grassland with scattered trees, and are cavity nesters. I photographed the Bluebird with my Nikon D300 and 600mm lens at ISO 200, f/5.6, 1/30 sec. This entry was posted in Bird Photographs, Wildlife and tagged bird photographs, bluebird, Cardinal, Carolina Wren, Downy Woodpecker, nikon d300, Nuthatches, small birds, white breasted nuthatch. Bookmark the permalink. I loved this post! I know and love all of these birds, but my equipment and skills are not nearly good enough to capture them in this much detail. They looks like portraits. You have reached the peak of your expertise. It would appear that these birds came to your studio and sat for their portraits. I had to step back when the bluebird appeared on my screen; it thought it would jump out at me. Just remarkable. hehe the last one really looks “angry” 🙂 love those photographs! wonderful! Thanks for following my blog! 🙂 These are really great photos! I’ve always been partial to photos of birds, and it’s also great to put the names with the ‘faces’ so to speak!